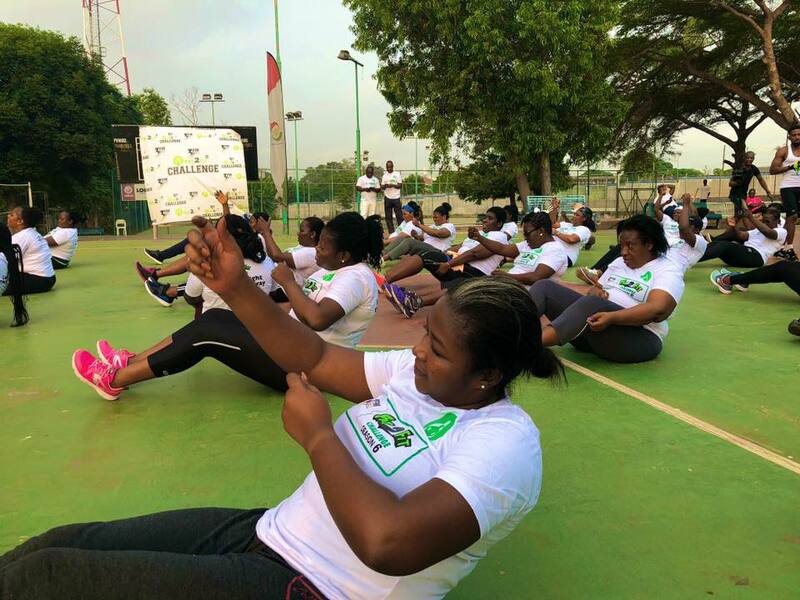 The 60-day fitness challenge put together by Fat2Fit Ghana and 3FM, aims at encouraging and helping Ghanaians eat healthily and exercise regularly to shed off some weight. Within the next 60 days, participants will be encouraged to adopt the healthy eating lifestyle, especially eat plant-based meals, as well as exercise regularly in order to arrive at their ideal weight and decrease the chances of getting lifestyle diseases. They will also be given meal and exercise plans to follow out and would be monitored regularly to stay on the programme. At the launch, participants were taken through weight screenings to check their body mass index and fat levels. They later engaged in light stretches and aerobics sessions as starters. The person to lose the most weight at the end of the 60-day challenge will be crowned the Biggest Weight Loser and would take home amazing prizes, including a six-month free gym membership with the Aviation Social Centre, a change in wardrobe, freezer, juicer, and healthy food vouchers. Founder of Fat2Fit, Akoto DerGross commended participants for taking their health status seriously for which reason they have signed up for the challenge. He also encouraged participants to be consistent with their health choices, especially the meal plans provided for them. Mr. DerGross explained that the challenge was organized to serve as a guide and motivation for individuals to not only lose weight but also to make healthy eating a lifestyle. A representative from the Ministry of Health, Kofi Adusei underscored the need to exercise daily, and urged Ghanaians to annually check their health status so they stay healthy always. General Manager in charge of Operations and Shared Services at Media General, Winfred Afful, said 3FM as a lifestyle radio station, is not only concerned with providing listeners with knowledge and information but also ensuring listeners have the opportunity to make healthy lifestyle choices. Meanwhile, Dr. Ama Diafo, a previous participant was present to tell her Fat2Fit story to serve as an inspiration to the new participants as they embark on their weight loss journey. The sixth edition of the 3FM Fat2Fit 60 Days Challenge is being sponsored and supported by Aviation Social Center, Prudential life Insurance, Cuba Investments, Centre for Scientific and Plant Medicine Research, Moringa King, Top creativity (Bitter cocoa), N8tive food and beverage bar, Ekay collections and Verna mineral water.